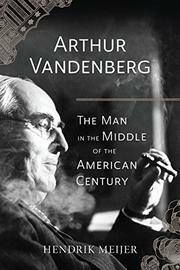 The executive chairman of superstore chain Meijer, Inc. offers a detailed and admiring biography of Arthur Vandenberg (1884-1951), who played key roles in forming U.S. policy throughout the early decades of the 20th century. Meijer, who has published a biography of his grandfather (Thrifty Years: The Life of Hendrik Meijer, 1984) and produced a documentary about Vandenberg (America’s Senator, 2011), has done a thorough job collecting and examining the pieces of the story of the Michigan Republican who served in the Senate from 1928 to 1951. In a text that moves with resolute chronology, the author notes the senator’s significant involvement in many important U.S. policy initiatives, including the United Nations, NATO, and the Marshall Plan. Although Vandenberg was initially an isolationist, he gradually changed his tune; by the end of his career, he was singing his full-throated support of America as an international leader. As Meijer demonstrates, Vandenberg worked across the aisle, which was a necessary strategy during the Franklin Roosevelt years when the Democrats held majorities in both houses. Vandenberg worked with fellow senators, Roosevelt, and President Harry Truman. The author also shows us a man with a wandering eye. Although he was twice married (his first wife died), he seems to have had an extended fling with another woman. The author describes and speculates but does not condemn these deeds, but he does suggest they could have been factors in his decision not to campaign more earnestly for the 1948 presidential nomination. Meijer gives us a portrait of a politician with somewhat of an old-school manner; he was an orator, a backroom master, and a strategist who loved hearing good things about himself (are their politicians who don’t?). Principally, he shows us a man who believed in working with rather than condemning his colleagues. A sturdy and necessary biography of a politically principled man who is sadly fading into obscurity. THE LEGACY, THE MAN, THE HONORABLE CONGRESSMAN JOHN CONYERS, JR.